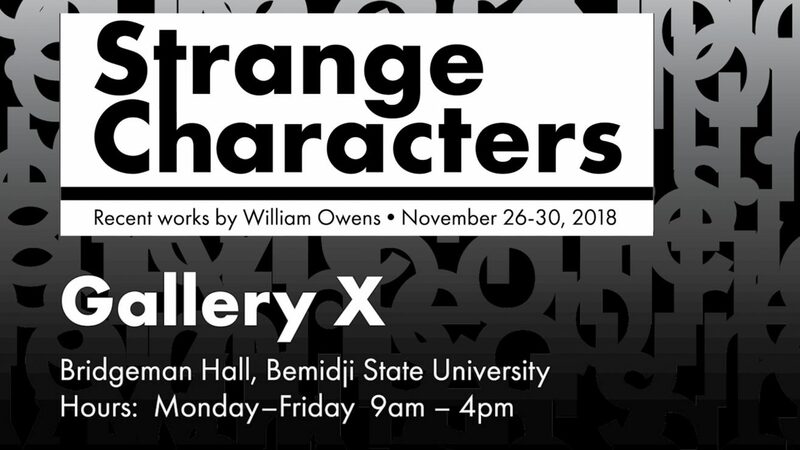 Bemidji State University senior, William Owens, will host an art show in Bridgeman Hall’s Gallery X from Nov. 26-30. The art showcase, entitled “Strange Characters,” explores the artistry of font and type using paint, sculpture and mixed media. “This exhibit focuses on seeing text and type in a purely aesthetic sense by removing legibility and allowing the viewer to concentrate on the form,” Owens said. Owens, of Devils Lake, N.D., will graduate in May 2019 with a Bachelor of Arts in visual arts. The week-long gallery exhibition is in partial fulfillment of his graduation from the School of Technology, Art and Design. “The broad focus of my art is the celebration of the mundane, taking something that’s often overlooked – the shadow in the corner of the room, the texture after patching drywall, the space between the letters you’re reading – and imitating and exemplifying it to make it interesting,” Owens said. Bemidji State’s Gallery X is a student-directed gallery that offers students the experience of planning and executing an art show with their own artwork or that of their peers. The gallery is open Monday-Friday from 9 a.m. – 4 p.m.
Students enrolled in the School of Technology, Art and Design can choose from nine different programs. All programs are hands-on, interdisciplinary experiences that use high-tech, state of the art technology to build broad perspectives and specialized skills.